Dodging Thursday's downpours, 300 Connections Charter School students used their bodies to form a massive turtle as a performance-art project that included a social message. "Just being out here today, it's going to be fun," said 10-year-old Isaiah Danini-Haynes as he knelt on the wet grass of the soccer field on the makai side of Kamehameha Avenue. "It's going to be the best." 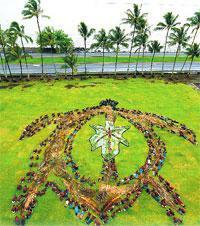 Wearing their school's brown T-shirts, students in kindergarten through 10th grade formed the 100-foot-by-100-foot likeness of a honu petroglyph. Palm fronds, banana leaves and kukui leaves were used to make the outline of the turtle's shell. The "sky" turtle -- called that because it was best seen from the air -- was the result of a collaboration between Oregon-based artist Daniel Dancer and Kaholo Daguman, Connections' literary coordinator. "The whole point for me is to help people see the big picture," Dancer said. "If we can rise above our problems, we see how all the parts fit into the whole." The art form, which can be traced back thousands of years, he said, serves as a metaphor for social commentary and change. "It's kind of like a prayer for the turtle. It's endangered," Dancer said of his first Hawaii project. Dancer said he relies on private grants to help pay for his artwork. His next project will involve assembling 850 Iowa school children in the shape of a mountain lion. The honu was selected because it's Connections' mascot, while kukui leaves serve as its symbol, Daguman said. "This is part of our schoolwide art project," he said. Daguman said he sees the importance of thinking globally. "Hopefully, (Dancer will) broaden the prospective of some of the kids," he said. Principal John Thatcher donned a black shirt and joined with other faculty and a few students to form the turtle's head by lying on their backs. "I hope it doesn't rain too hard, but I guess turtles need water," Thatcher said as he waited for the students to arrive. The students walked from their downtown campus just as the rain stopped. A downpour occurred only moments after the hourlong exercise was completed. Jadeann Miller, 9, said the rain doesn't bother her and that she appreciates the art form. Sarah Erickson, also 9, agreed. "I think it's really cool that you only get to see it from the sky," she said. Her friend, Tara West, said she once got to swim with honu and looked forward to seeing pictures of the "art for the sky" project. "It's exciting," the 9-year-old said. "I can't wait to see the honus." Dancer and assistant Rose Madrone of South Point photographed the display from a roughly 70-foot-high perch. Their vantage point was a large boom truck that Jacunski's Complete Tree Service donated for the project. The spectacle attracted passers-by and numerous drivers beeped their horns in apparent support. Dancer said he hopes to return to Hawaii each winter to do a similar art project with a different school. Jason Armstrong can be reached at jarmstrong@hawaiitribune-herald.com.